Hello to all my friends out there in blog land. Today I am going to share a really quick card with you that I was inspired to make from this weeks Tuesday Trigger - The Pyrex Effect at Moxie Fab World. By really quick card, I mean that I threw this baby together from start to finish in less than 20 minutes.....probably one of the quickest cards I have made in a long time. Just look at all of that yummy orange color. I remember my grandmother having a set of bowls exactly like this when I was a kid, so I just had to make a card based on this photo. So, what do you think?? 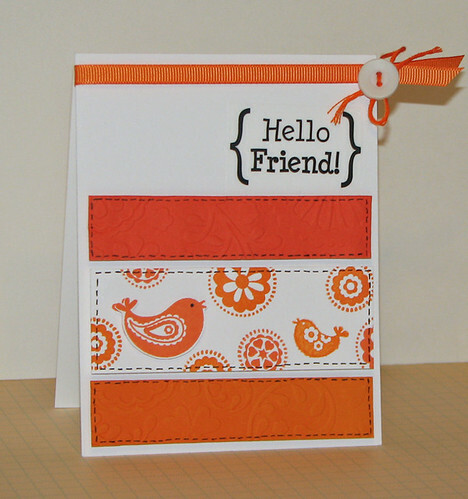 Cardstock, ink, ribbon: Stampin' Up! wonderful take on the trigger! Perfect interpretation of the picture. Love your card. You couldn't have done better! 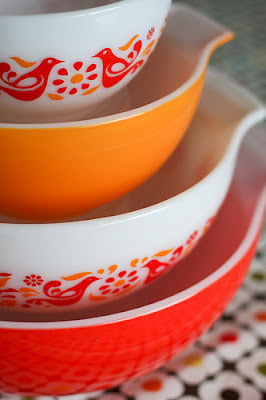 I love the bird paper that "matches" the birdie on the bowl!